Sometimes I am just so blown away by the beautiful locations that I get to shoot. This engagement session was a prime example of this. Miranda and Dave chose the most amazing spots for their engagement session. The Scarborough Bluffs in Toronto are a popular spot for photographers and you can definitely see why. Not only did we utilize this beautiful spot but nearby we found an enchanted forest filled with wildflowers. I KNOW! It was crazy stunning. As soon as I arrived I immediately had a heart attack it was so amazing. Plus the light was so dreamy I could hardly stand it. Miranda and Dave are two of the sweetest people you will ever meet and they are so in love! They met at a church young adults function. It was total fate as Miranda wasn’t even planning on going that night. But destiny is destiny and after sitting at the same table that night there was no going back. 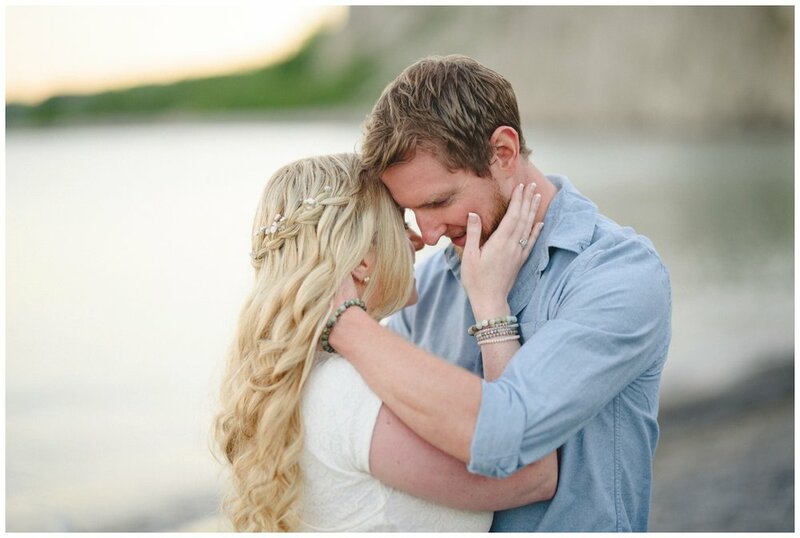 This dreamy summer sunset engagement shoot at Scarborough bluffs was the perfect way to showcase their love and they just melted into each other all evening. Miranda was like a long haired mermaid that stumbled upon her waiting prince on the beach.